I love to have a full set of lashes and often wish I was a cartoon so I could flutter so hard it’d make a fellow cartoon character get blown away. 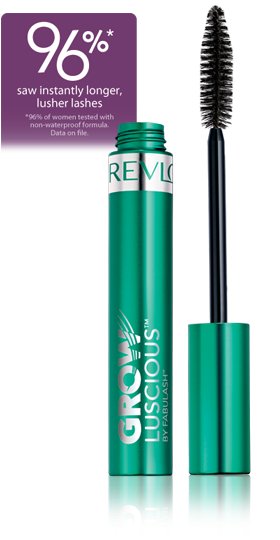 Ok, that may be a little too much to ask but with the latest mascara from Revlon, Grow Luscious, you’ll be well on your way there. I’ve never used a mascara by Revlon before – well, not that I can remember anyway, which means it doesn’t count. I’d heard rave reviews about Double Twist but never got round to actually trying it myself. When I was sent one of these cute green tubes to try I was expecting something pretty good but it exceeded my expectations. Grow Luscious claims to contain a lash enhancing formula which helps to improve their overall appearance and condition over time. Not only does it promise to give you longer and ‘lusher’ lashes, but it’ll make them grow?! Hell yeah, get me that tube stat. When I first opened the mascara I noticed the size of the wand – bloody huge. It’s at least 25% bigger than normal brushes so I did feel like a kid trying out their mum’s makeup and ended up getting it literally all over my face. (I thought I was being an idiot but a couple of fellow bloggers confirmed that they too had made this mistake!) As the brush is big and the formula quite dry it took a while to get used to, but after a few applications I had the knack. My lashes. Excuse the bags… I was tired. The giant brush enables you to cover a lot more of your lashes in one stroke, meaning it’s easier to ‘style’ them and basically curve them upwards so they’re more visible and ‘fluttery’. (Do you like my technical terms?) The thickness of the brush and minimal amount of formula on it also enables you to create a really natural look with absolutely no clumping. I love the result this gives because it gives me a fab look for the day without feeling like I’m overdone. I don’t know if I would wear this in the evening as I’m a massive fan of huge lashes and falsies, but this would definitely be a winner to wear from office to bar on a Friday night. I must agree with the green tube being much nicer to look at then some mascaras out there. Neon is not my thing. At all. I've heard a bunch of good things about this mascara but I've not yet seen it on lashes so this is great. Thanks for the review! I looked at it in the shop, as the growth promise is soo tempting, but honestly the huge wand scared me:( I know I would end up with mascara all over my eyelids!